A motivation for this research was to improve on the passive heat pipe by introducing a more active means of transporting the liquid phase in a self-contained heat transfer cell. A novel process, proposed by this research, was called Vibration-Induced Drop Atomization (VIDA). In this process, a small liquid drop is placed on a thin metal diaphragm that is forced to vibrate by an attached piezoelectric transducer. The vibration induces capillary waves on the free surface of the drop that, upon attaining the critical conditions, begin to eject small droplets from the wave crests. 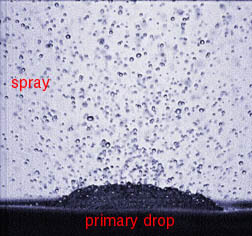 Under certain forcing conditions, this ejection process can develop so rapidly that the entire drop seems to burst into a fine spray of droplets that move away from the diaphragm (e.g., 0.1 ml water drop can be atomized within 0.4 sec). My Ph.D. research was part of the project "The Development of Novel, High-Flux, Heat Transfer Cells for Thermal Control in Microgravity" sponsored by the National Center for Microgravity Research. The principal investigators for this project were Prof. Ari Glezer and Prof. Marc K. Smith. My investigation was mainly focused on fluid mechanics aspect of the project, including fundamental mechanisms of the free surface dynamics, breakup, and spray characterization. VIDA was presented in A Gallery of Fluid Motion, edited by M. Samimy, K. S. Breuer, L. G. Leal, and P. H. Steen, Cambridge University Press, pg. 39 and pg. 47, 2003. VIDA was featured in the contributed abstracts of the Interfaces for the 21st Century: New Research Directions in Fluid Mechanics and Materials Science, edited by M.K. Smith, M.J. Miksis, G.B. McFadden, G.P. Neitzel, and D.R. Canright, Imperial College Press, pg. 298, 2002. Droplet Formation During the Atomization of a Viscous Liquid was awarded at the Annual Gallery of Fluid Motion, 54th APS/DFD Conference, San Diego CA, 2001. Mode Shapes of a Sessile Drop in Forced Vibration was awarded at the Annual Gallery of Fluid Motion, 53rd APS/DFD Conference, Washington DC, 2000. VIDA was featured in the Physics chapter, Science Year 2001, World Book Publishing, 2000. Vibration-induced drop atomization was presented at the American Insitute of Physics, Physics News web site, 2000. Vibration-Induced Droplet Atomization was awarded at the Annual Gallery of Fluid Motion, 52nd APS/DFD Conference, New Orleans LA, 1999.